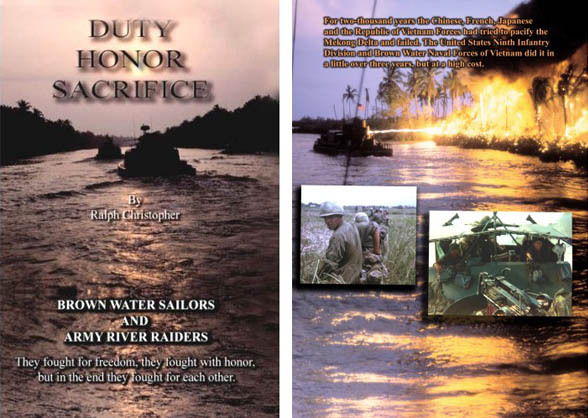 Written by Ralph Christopher – Ralph dedicates this book to all who fought in the rivers, canals and coastal wars in the jungles and rice paddies of South Vietnam, and to his many shipmates and river raiders abd friends who volunteered their stories. Without them, this book could not have been possible. Of the numerous exploits of the Brown Water Navy and 9th Infantry Division covered here, the Battle of June 19, 1967 near Ap Bac Village is detailed quite extensively. Signed Hard Dust Back Copy $30.00 includes S/H. Make check or money order out to Ralph Christopher. I haven’t received my copies yet but have been told it’s a excellent book. As we all no not that much has been told or published about the MRF & 9th Infantry Division in Vietnam. So Bravo Zulu to Ralph and the others who have made this book possible.. Comments Below: Ralph, I received the book yesterday and just finished reading it. I could not put it down. It sure brought back a lot of memories and filled in a lot of blanks that I was not aware of. As it turned out I talked to Blackie Bolduc yesterday and told him I had just received the book. He said he was looking forward to getting his copy. You did a great job. Thanks a lot. Major Ron Menner CO/A/CO 3rd/47th 1966-1967. Thanks for the kind words of our book. I never know until you guys review and let me know, and your reviews are the only ones I care about. I told my wife that I sat down with you, Mike and Blackie a little over a year ago and told y’all I was thinking of writing a book on the MRF, thanks to Albert, but had no idea where to start. You guys took me under your wings, and trusted me, and I am so happy that y’all like it. Jack Benedict, Charlie 4/47th, sent me a nice letter also. I was very proud of the fact that I was able to include all the different Navy and 2nd Brigade units, and hope it brings us all closer together, for we truly were fighting the same communist forces and defeated them. We knew so little about each other back then. Thanks for helping me. As I say to all my brothers, you are all authorized to sign my books if anyone asks, and I hope they do. For you are the real Stars and I merely a story teller.